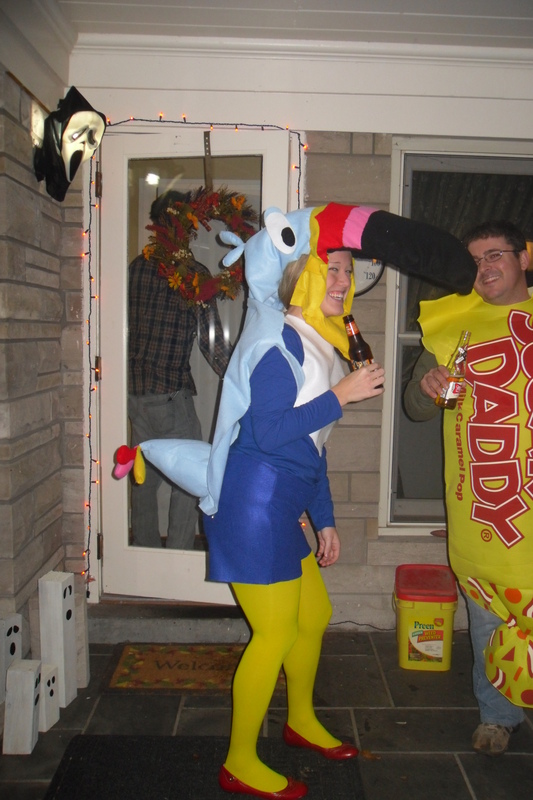 The In-Law’s Halloween party, disappointing it was not! 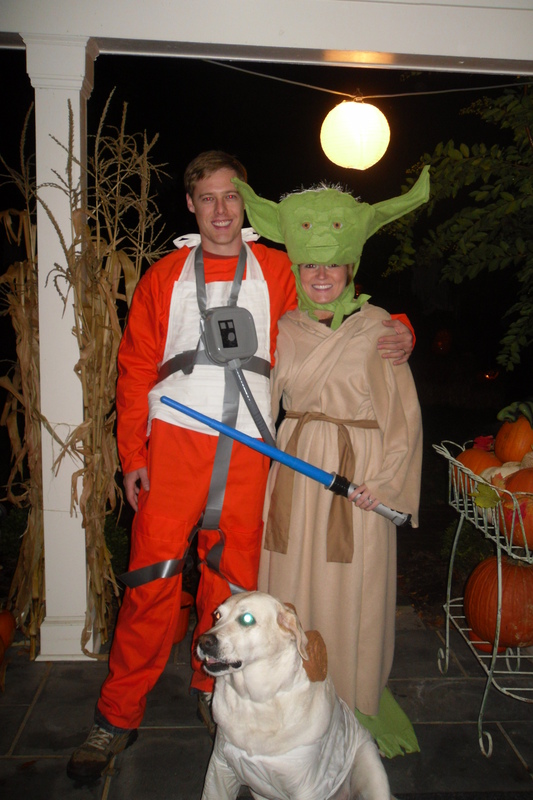 Oh yes, this year Chris and I (and the dog) did a star wars theme. All the hub’s idea of course! I didn’t want to do the traditional played out Princess Leia with the cinnabuns and Chris only wanted to choose from the original cast characters so I decided that Yoda was the only way to go. Chris chose the rebel flight suit that Luke Skywalker wore, and I left Princess Leia for Harper to wear. 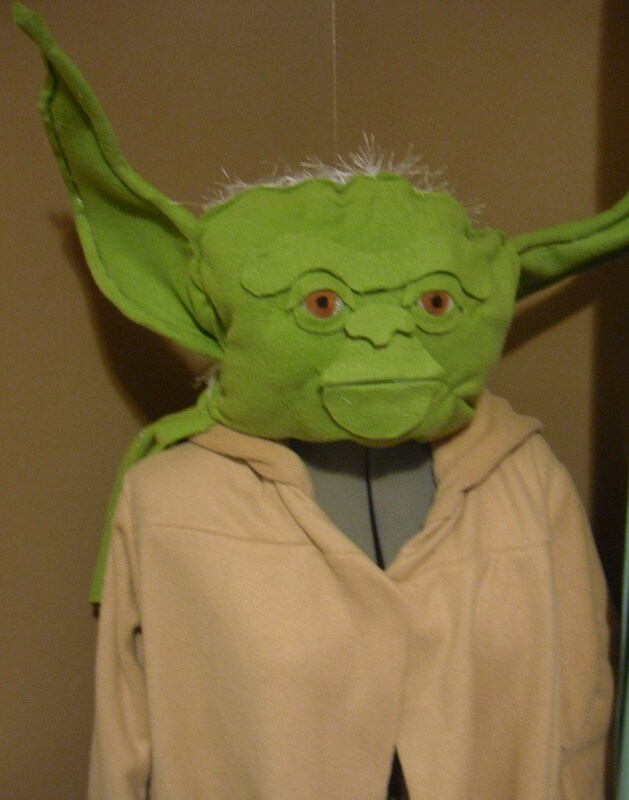 Yoda’s head was relatively easy to make compared to some of my past costumes. I took a beanie and sewed green fleece around the edges and stuffed it full with polyfil. I glued on small styrofoam balls cut in half for each eye and then flued on his featured with leftover green fleece and felt I had in my stash. His ears were shaped with pipe cleaners and sewed into the seams of the head. 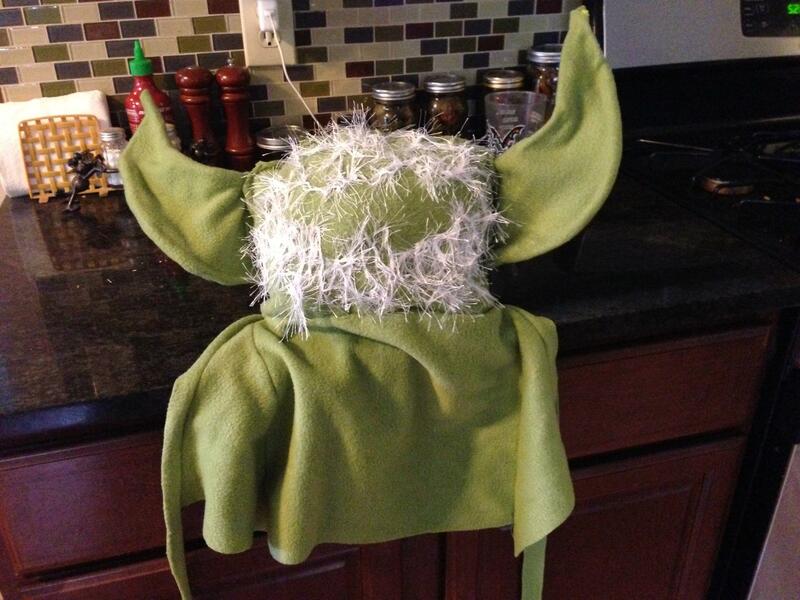 I used a robe pattern to make his hooded robe, and I made Yoda feet with foam and extra fleece. I found some “furry” yard to use for Yoda’s hair on the back of his head. 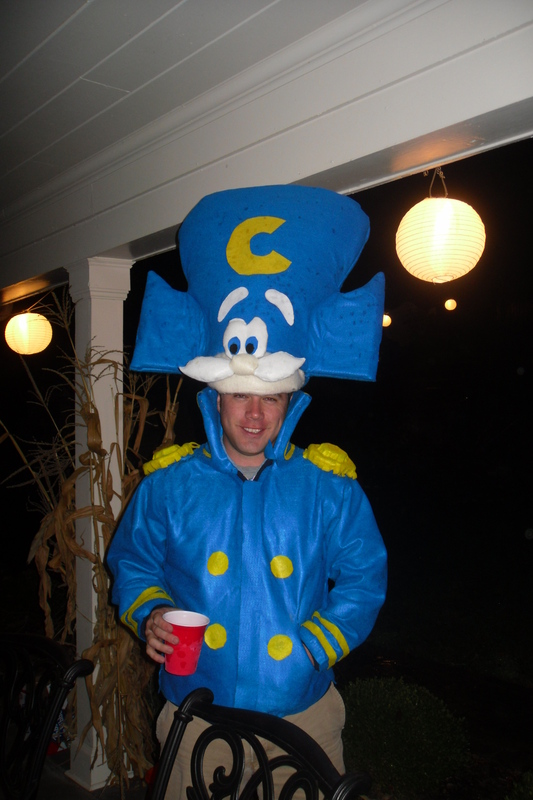 I made sure to leave a sheet of fleece around the bottom with a tie so that it would stay on my head all night. For Chris’s rebel flight suit I used a jumpsuit pattern from and old Halloween costume pattern his mothe had for a lion. I added the cargo pockets on the legs and the arms. 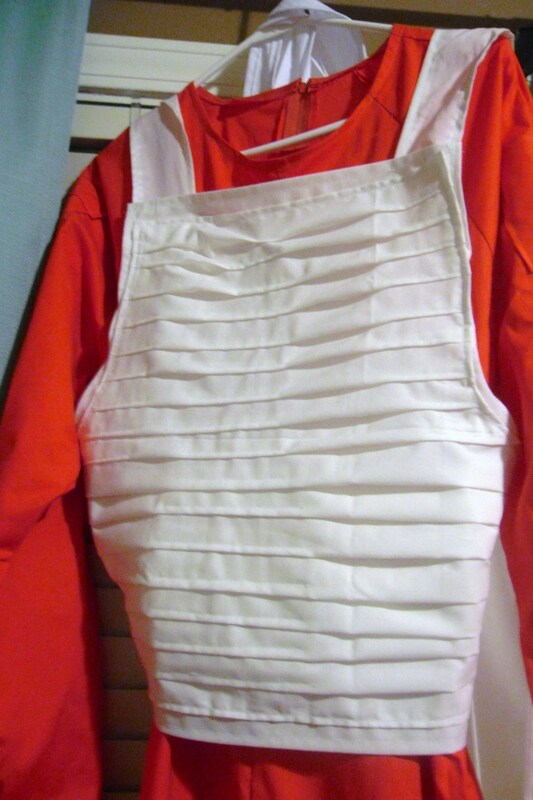 The vest I used some white muslin I had in my stash and I pinned it into “shutters” to create the ridged effect Luke’s vest had. 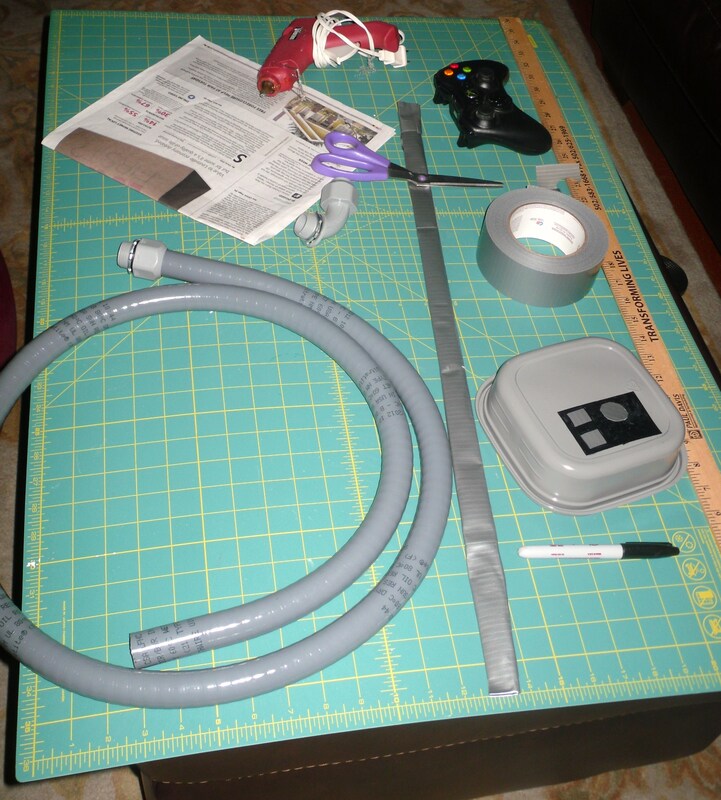 I left him in charge of the box and gears Luke wore in front, he went to home depot and got plastic tubing, duct tape, and gray spray paint and piece everything together on a tubberware container he paint sprayed. 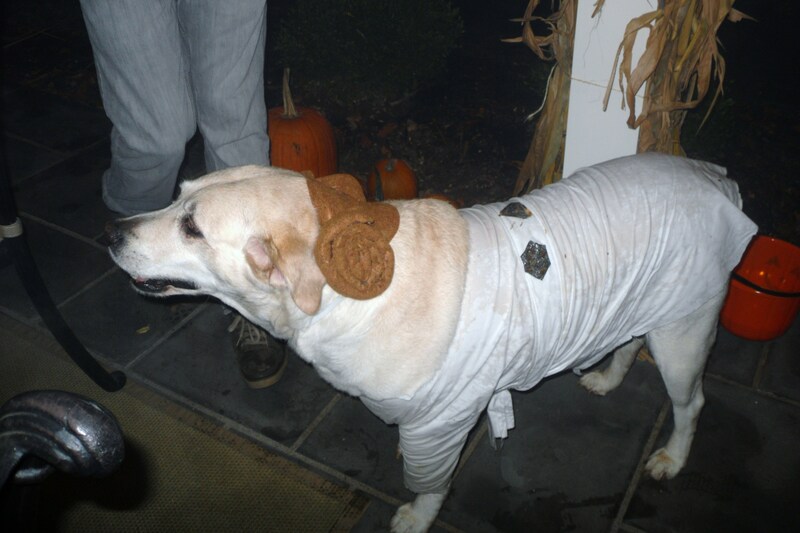 For Harper’s costume, I used the pattern from her doggie jail suit last year but just used white cotton. I made a belt and added on Princess Leia’s silver details with some leftover scraps of metallic silver material I had from a previous Halloween. 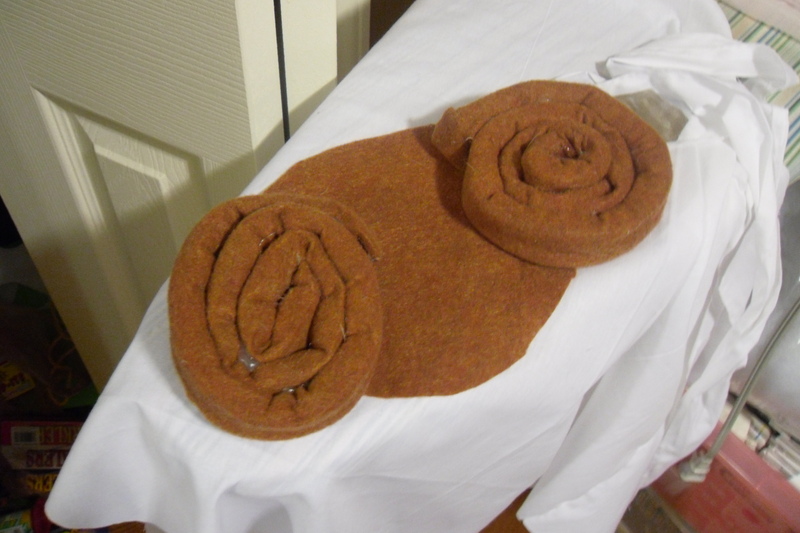 I used brown felt and a glue gun and just rolled up some cinnabuns and sewed an elastic chin strap to the bottom. 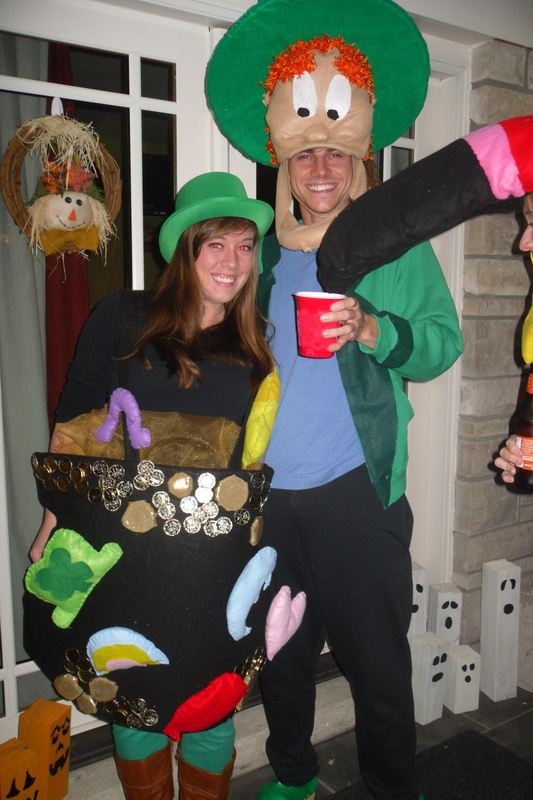 The party was so much fun, and my Yoda ended up winning the costume contest! 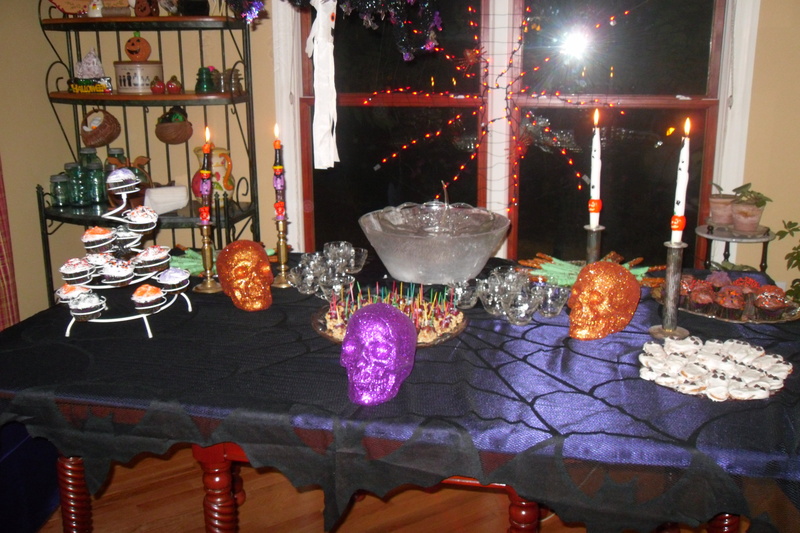 There was also a contest for the best Halloween appetizer and the best carved pumpkins. Here are some of the crazy food platters, the first three I made. Powdered donut hole eyeballs. 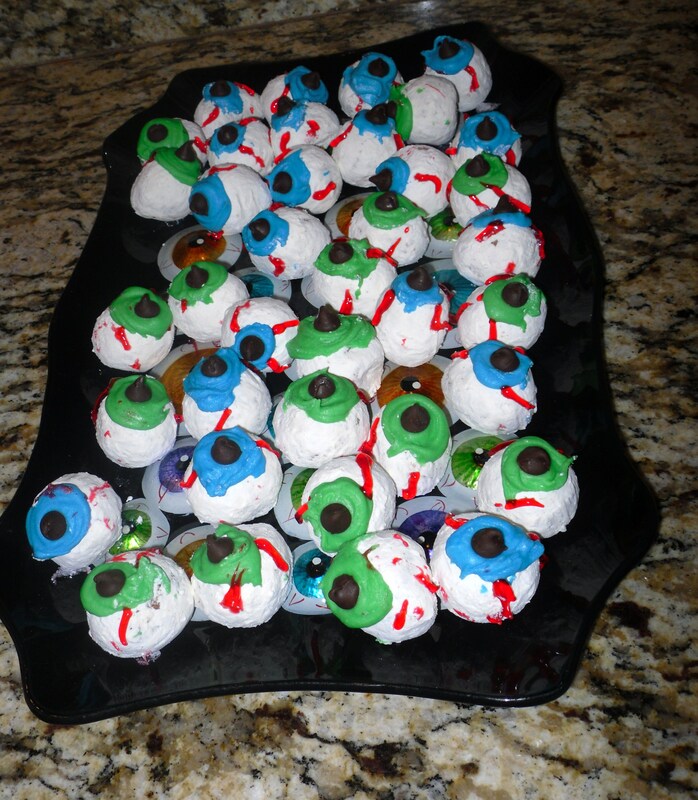 The irises are melted white chocolate with green and blue food coloring, the pupils are chocolate chips and the blood vessels are red gel. 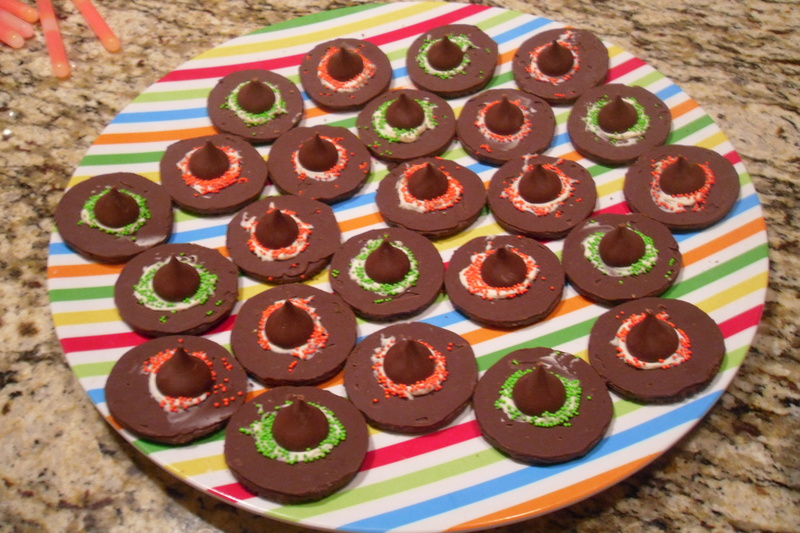 These are little witches hats I made with chocolate cookies, icing, hersheys kisses, and sprinkles. 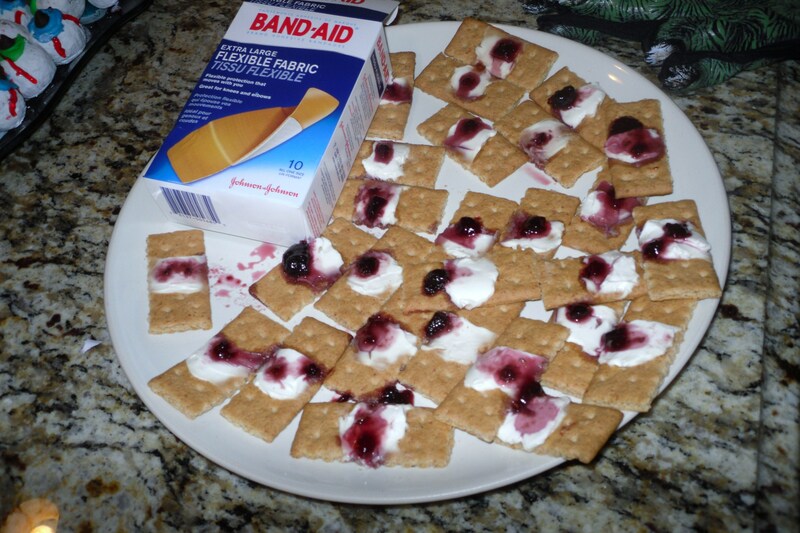 These are bloody bandaids, made with graham crackers, cream cheese and strawberry jam. 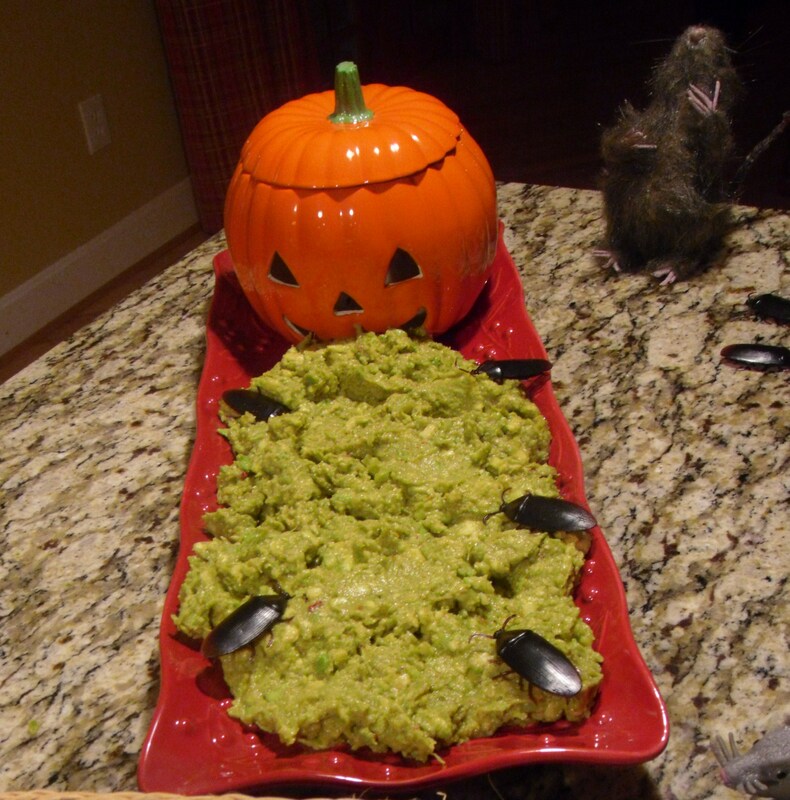 Here are some of the spooky foods my Mother In Law put together; pumpkin barfing guacamole, and a table full of goodies like pretzel witch fingers, carmel peanut grapes, ghost nutter butters and Franestein and lily’s special brew. 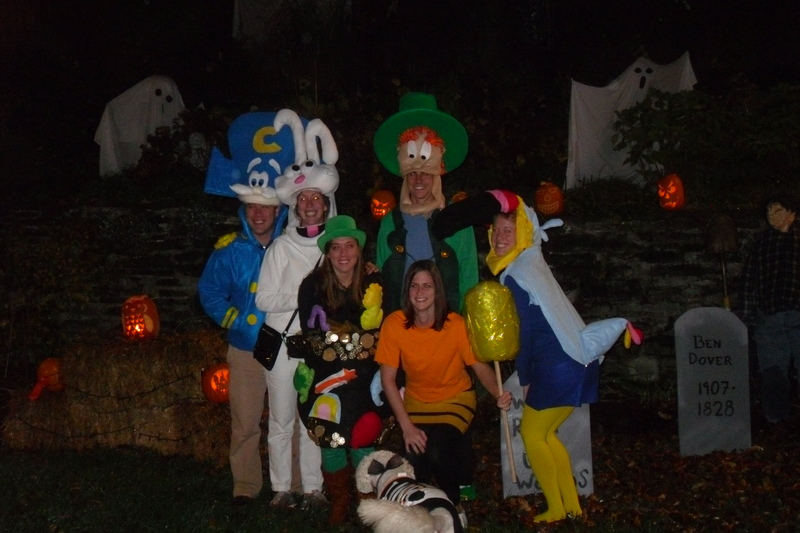 There were so many fantastic costumes including the cereal character gang, Captain crunch, the Trix rabbit, Luck charms and Toucan Sam, as well as Carme San Diego and the USA volley ball team. Two nights before the party we had a pumpkin carving extraganza and carved about 20 pumpkins, it was extreme! 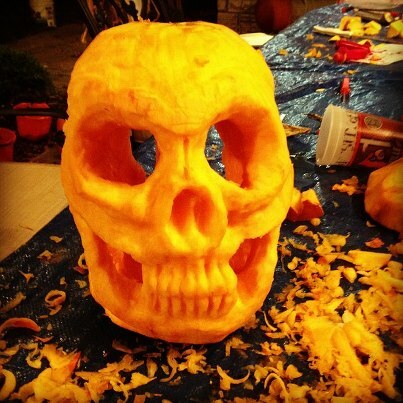 This one was carved by my friend Jackie, she used a potato pealer and some other tools to shave this into an amazing skull. Obviously she won the pumpin carving contest! 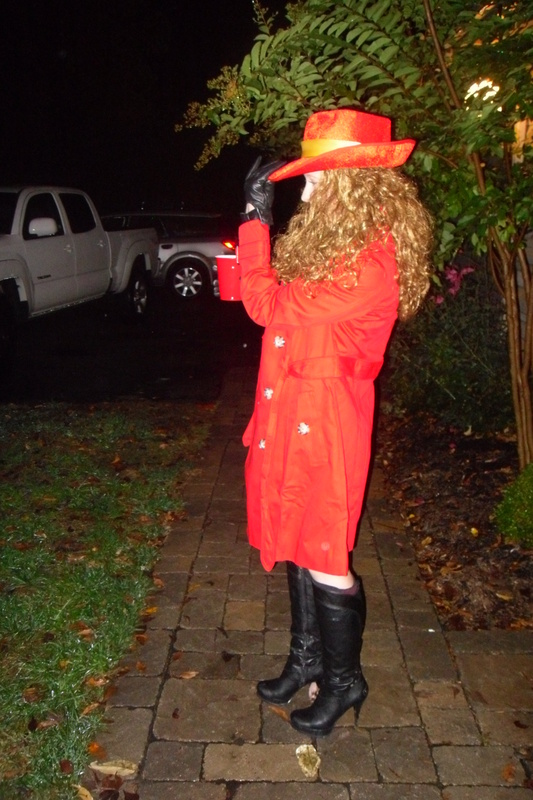 More Halloween festivities to come, hope you all have a spooktacular holiday! Heeeey–ooo! I’m still alive! I started a new job teaching sixth grade about a month ago while doing my student teaching simultaneously so needless to say I’ve been one busy bia! The kids are crazy but its going smoothly, and I have a great supportive staff. I have also lost about 5lbs from running around and not having time to snack or eat a big lunch all day! My sewing has slowed down but I am hoping that once Thanksgiving and Christmas breaks come up as well as my much anticipated graduation I will have some more time on my hands. I finished this Cynthia Rowley dress a little while ago and I think it turned out pretty cute. I used a super soft knit in a floral/paint splatter print. Its super cozy and the knit material eliminated the need for the zipper. I left a bit of room around the middle where the band was because I didn’t want it to cling on too tight. I love the pockets too! I almost left the sleeves off but since its getting cold real quick here I figured I might as well make this a Fall dress. 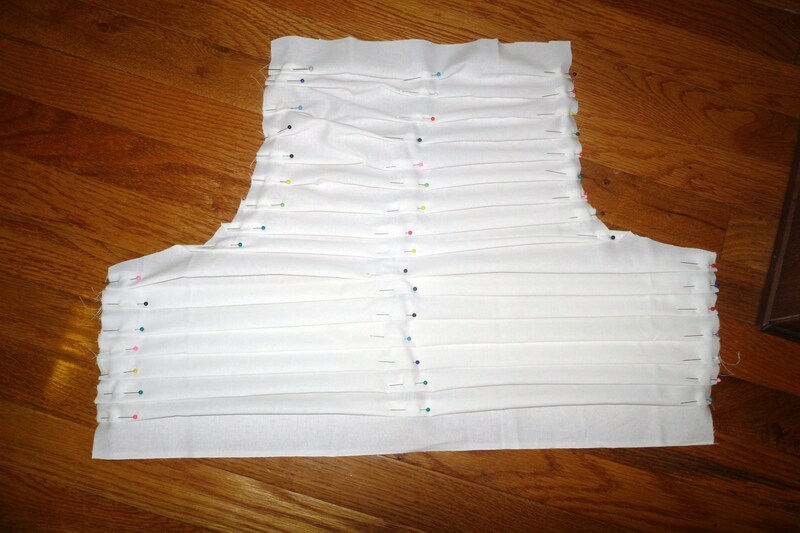 In other sewing news I have begun our Halloween season of costumes! This year I decided to let the hubs pick out theme, so he of course being the nerd he is chose Star Wars. I think he was hoping I’d roll with the slave princess Leia “outfit” but unfortunately for him I ain’t baring all in public. So be ready for some ridiculous photos to come! 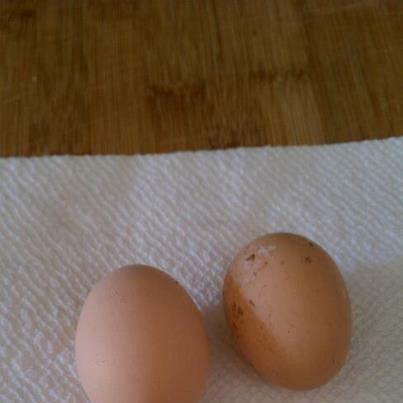 Oh and our chickens finally started laying eggs! I’ve been making all sorts of delicious egg foods- steak and eggs, quiches, egg salad, baked goods, etc.. and they are delish!